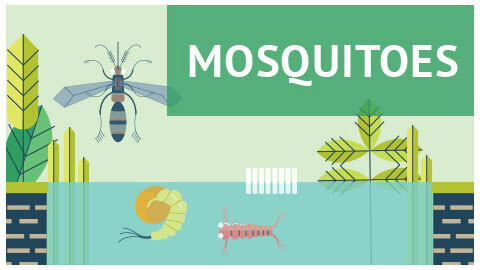 More than 30 species of mosquito live in the Edmonton area. One of our most significant nuisance species is the vexans mosquito (Aedes vexans). High mosquito biting activity can make summertime activities very uncomfortable. There is also the risk of getting West Nile virus. The City monitors and updates weekly Edmonton mosquito activity during the mosquito season. We welcome your assistance in controlling mosquitoes in Edmonton. Report any standing bodies of water that occur within residential areas by calling 311 or emailing treebugs@edmonton.ca. These are potential developmental sites for mosquito larvae. City crews will inspect the site and treat it, if required. Report the locations of bee hives or fish ponds that occur within the boundaries of our mosquito larvae control program. A microbial control can be used in these areas. Drain or fill low-lying areas that collect and retain water that mosquitoes can breed in. Containers such as old tires, rain barrels, or even eavestroughs can be a potential breeding site for some species of mosquitoes. These should be inspected regularly and drained if larvae are found. Keep ornamental pools, ponds, and dugouts free of vegetation around the edges. Fish that eat mosquito larvae can be added to bodies of water. Mosquito adults require shelter. Cutting tall grass, weeds and underbrush removes the areas of shade and high humidity that they need for survival. Help keep them outdoors by ensuring that screens are in good condition and that doors and windows fit properly. When outdoors, loose fitting, light colored clothing will reduce biting. In areas where there are heavy populations of mosquitoes, wear high top boots, long pants of a heavy material and a shirt or jacket of similar material. Infants are particularly vulnerable to mosquito bites. Ensure that strollers and carriages are fitted with mosquito netting. On exposed skin areas, personal repellents can be considered, but avoid contact with the eyes, nostrils and lips. Some repellents can dissolve plastics, paint and varnishes or damage synthetic fabrics. Follow label instructions carefully and use with caution. As a last resort, products such as mosquito coils, propane foggers and residual insecticides are sold by seed stores, garden centres and hardware insecticide retail outlets for short-term relief of biting activity around the home. Electronic insect killing traps using ultraviolet or black lights as an attractant are marketed to control pest insects in yards and other outdoor areas. Most evidence indicates that these traps are ineffective in reducing mosquito biting. In recent years, several manufacturers have attempted to market battery operated pocket-sized devices that emit sound waves that supposedly repel mosquitoes. Again, there is no evidence to support these claims.